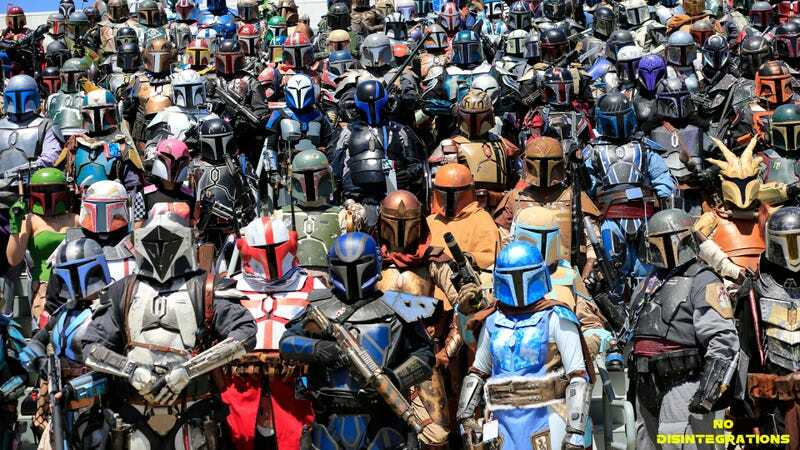 How many Mandalorian mercenaries can you fit in the Anaheim Convention Center? Looks like all of them. With close to a hundred of them in the shot above alone, Mandalorian mercenaries (or Mandos for short) make up the majority of our second batch of Star Wars Celebration 15 cosplay photos, courtesy of the fine folks working on the cosplay documentary No Disintegrations. And why not? It’s the most customizable of Star Wars costumes—as long as you’ve got the signature t-shaped viewport and a little armor, the sky’s the limit. They’re the My Little Ponies of Star Wars. Coming in a close second are the Clone Troopers, who add a burst of fruit-juicy flavor to the standard white to make that armor their own. I’d love a set of trooper armor myself, but given my height, girth and ever-growing beard, I’d most likely end up as another old guy in a beige robe. I’m pretty okay with that. Enjoy the rest of the shots below, including a nice bunch from the event’s official costume contest.